Since 1987, when Aviemore and Vicinity Community Council first had the idea for a Sister Community across the River Spey, dedicated members of the community, Rothiemurchus, and leading professionals have been all been collaborating to create a place we are proud to call home. I am delighted that after centuries of decline that the population of the Highlands has started to grow and believe that where there is a good livelihood, communities should be enabled to expand in a sustainable way. For decades landowners have been criticised for preventing development and so when I was approached by the Aviemore and Vicinity Community Council, The Highland Council and Scottish Homes and had the support of neighbours, including the RSPB, I was ready to listen. I chose David Sim of Gehl Architects, who is Scottish but works in Scandinavia as the best person to help our community. Scandinavia is well known for the successful application of design principles in a climate like ours, where they are used to living close to trees, as is the tradition in Rothiemurchus. I believe that we are very lucky to be able to use his knowledge and experience to enable us to make a new village that is right for its place and people and will be appreciated for generations to come. Gehl Architects say that it is ‘crucial to the success of a place is that the future inhabitants have a shared understanding of sustainable development’. Please take this opportunity to share your ideas and to be able to say in twenty years “I was there, I did that”. The initial vision for a sister community for Aviemore across the River Spey, at An Camas Mòr, with essential housing, vital public services and a Countryside Park on both sides of the River came from Aviemore and Vicinity Community Council in 1987. The application is well thought through, there are comprehensive recommended conditions, the proposal has been in the public domain for 25 years, and “the fundamental public interest in terms of environment, economy and culture is overwhelmingly in support”. 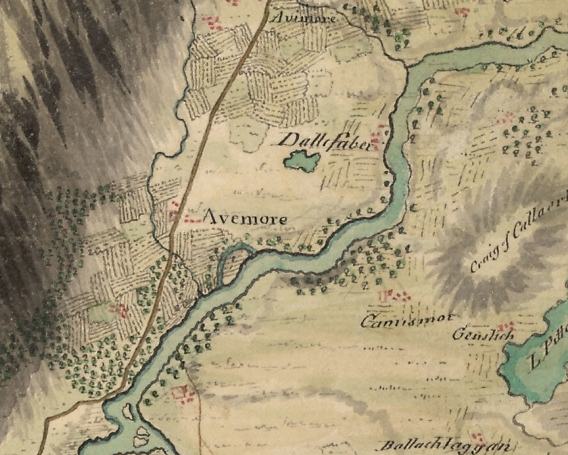 An Camas Mòr, in Rothiemurchus, literally translates as ‘The Big Bend’ in the River – it is marked with almost as many homes as Aviemore on Roy’s Map 1747-55, the first detailed map of Scotland: Rothiemurchus removed grazing animals from site and replaced them with a coniferous plantation following a 1994 Local Plan Public Local Inquiry which requested that the site was planted with trees so that the village could not be seen from the hills and to create a sheltered climate. Today, there is still an urgent need and demand for homes that people in local jobs can afford according to an independent survey report by The Highland Small Communities Housing Trust. It is essential at a local level that the project moves forward to provide a structure and sustainable wider community, rather than the bit by bit development without planned infrastructure that Aviemore has seen in recent history’. Alastair Dargie, Vice Chair and Secretary Aviemore and Vicinity Community Council. Chair, Aviemore Enterprise Company. The site was adopted into the Local Plan in 1997 after a Public Inquiry set the design parameter for An Camas Mòr. The Cairngorms National Park Authority granted Planning Permission in 2014. The successful application was for a new sustainable community including space for 1100 jobs, community buildings, playing fields and up to 1500 residential units. An Camas Mòr has been working extensively with representatives of the Scottish Government, The Cairngorms National Park Authority and relevant statutory bodies in scoping infrastructure requirements. Ecological and environmental studies have been undertaken to demonstrate that the conditions attached to the permission have been met. By working with the rest of the design team we can have the first homes ready by 2021 – the plan is phased over about 30 years with about 50 homes a year. Gehl Architect’s process always begins with people, by listening and engaging with the future residents of a community, which is why we turn the design process upside down and start our projects by planning for life first – then space – then buildings. Gehl have been working with the local community since 2005 when The Community Council led the first public meeting. Lead architect David Sim and Louise, Landscape architect recently visited Strathspey for the ‘Share your ideas’ Community Events. 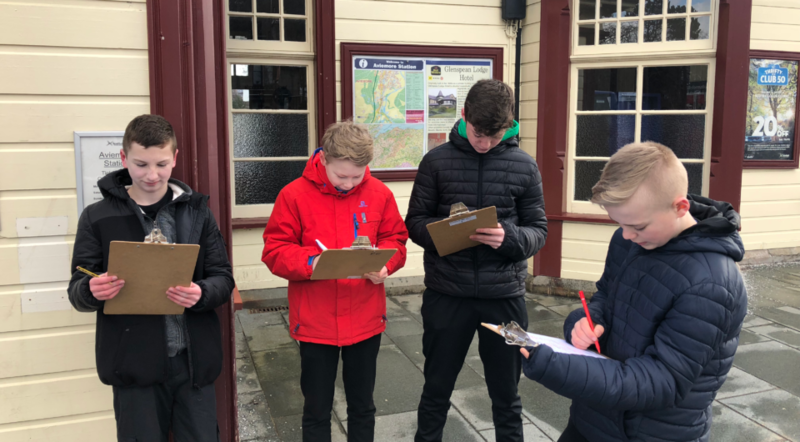 They met 200 local community members over 4 days, including Aviemore Primary, Kingussie High and Grantown Grammar Schools and the local business community. The findings will be used to inform the next stage of the design.